This was a very Paul Thomas Anderson sort of film. PTA crafted an unique/atypical love story (and a somewhat cautionary tale regarding loving an artist) between two highly-complex sociopaths that was tremendously well-acted by Daniel Day-Lewis, in another highly committed performance, and newcomer Vicky Krieps, in a star-making turn; both of whom were supported by the ever-reliable and commanding Lesley Manville. As expected, the costumes by Mark Bridges were gorgeous; but more unexpectedly was the beautiful score by Jonny Greenwood, lead guitarist of Radiohead. 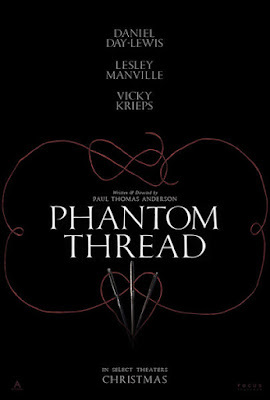 PTA wrote and directed Phantom Thread and it is hard to imagine that it was not in some way sort of semi-autobiographical. Nonetheless, this historic fashion drama is unlike Saint Laurent or YSL, but a highly nuanced character study of one very unlikeable man, and his equally unlikeable muse. However, the strength of PTA's work laid in layering these characters for they were never really outrightly detestable. At the heart of it, this was a love story. But one that lacked the expected passion. However, although that was the case, there was a genuine feeling of love and affection between the two leads. Day-Lewis and Krieps had great chemistry, and the latter more than held her own. As said, this was finely tuned narrative of two deeply flawed characters. Seriously, they are perhaps even more unlikeable than the cast of Three Billboards Outside Ebbing, Missouri. And there was humour. A surprising amount of wry, dry humour. Mostly courtesy of Day-Lewis and Manville. The famous British wit. PTA's direction was superb here, with beautifully shot one-takes that emphasised the flow and rhythm of the narrative, as well as expertly framed moments that heightened the tension to almost dizzily suffocating. The story was paced very well with nary a wasted scene or moment, and he relished in the faces of his actors who do not disappoint him with their nuances, from an arched eyebrow here to a side-way glance there, or a pursed lip here and lip quiver there. Brilliant acting with a brilliant doctor. In what is supposedly his last role, Day-Lewis proved once and again that he is one of the best actor of his generation. If it was not for Gary Oldman's excellent portrayal of Winston Churchill in Darkest Hour, the Oscar might go to Day-Lewis (Sorry, Timothee, you just got to wait your turn and maybe prove that you get act-act). Day-Lewis has the mannerisms of a dressmaker down. It never felt like he was acting but that he was really taking your measurements and fitting you. He was not just going through the motions of a dressmaker, but instead he was a dressmaker. That is commitment. Combined that with his absolute submersion into character, he was a marvel to watch. Krieps was a standout. As a newcomer against established veterans like Day-Lewis and Manville, she more than held her own. Her face was capable of a complex range of emotions that felt authentic. Hopefully this role would open more doors for her, but it is up to her to choose which doors to go through. Manville deserved her Best Supporting Actress nod. Her scenes with Day-Lewis were absolute delight even though they were mostly the quieter ones. Gosh, that woman can do more with an arched brow than most other actors with their whole body. But ultimately, her role was less showy than her fellow nominees, so her chances of Oscar glory looks slim. Maybe a BAFTA? Greenwood's score was beautiful. It was omnipresent but never intrusive and so elegantly carried the narrative, bolstering the dramatic moments and livening the lighter scenes. It would be a pleasant surprise if Greenwood wins against perennial favourites like Alexander Desplat, John Williams, Hans Zimmer and Carter Burwell. Phantom Thread is not everybody's cup of tea. It is a character drama wrapped up in pretty organza and tulle. It may not be PTA's best work, but it still stands as one of the best picture of the year (2017).